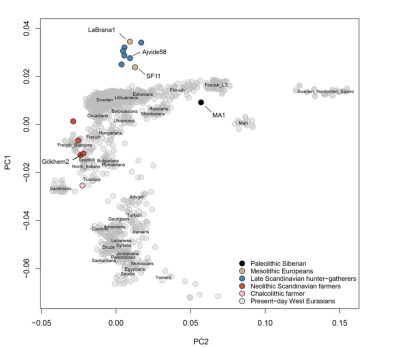 Here's an Admixture graph from a paper published in Science today, which focuses on ancient genomes from Mesolithic and Neolithic Sweden. I think it sums up very succinctly some of stuff we've discussed at length on these blogs in recent months. Note that it's the Neolithic farmer, Gökhem2, and post-Neolithic European, Oetzi the Iceman, who appear to be mixtures of two very distinct Eurasian clades; one shifted towards Sub-Saharan Africa, and the other basically identical to that of European hunter-gatherers. On the other hand, hunter-gatherers La Brana1 and MA1, from Mesolithic Iberia and Upper Paleolithic Siberia, respectively, are each derived entirely from two closely related north Eurasian hunter-gatherer clades. Moreover, Ajvide58, a hunter-gather from early Neolithic Gotland, appears to be a mixture between these clades. 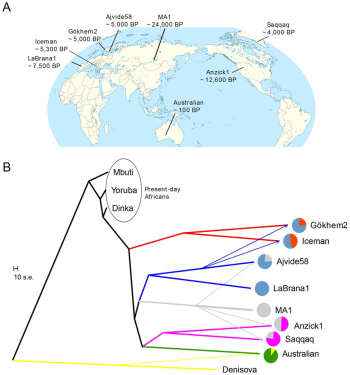 Note also that the ancient Amerindians, Anzick-1 and Saqqaq, are significantly East Eurasian (pink clade), but the ancient European and Siberian foragers don't show this ancestry. The distinct features of the two Neolithic Scandinavian groups; non-symmetric gene-flow into farmers, low level of diversity among hunter-gatherers and strong differentiation between groups have important implications for our understanding of the demographic histories of these groups. The greater diversity in the farmer population may have been influenced by gene flow from hunter-gatherers. However, the low level of genetic diversity in Neolithic hunter-gatherers likely has a demographic explanation, similar to the Iberian Mesolithic individual (8). Although we cannot exclude that this low diversity is a feature restricted to the Gotland island hunter-gatherer population, we note that this may be due to the fact that their ancestors resided in ice-free refugia in Europe during the Last Glacial Maximum (LGM), potentially causing population bottlenecks. Climatic changes and occasional population crashes, likely affected the population sizes of hunter-gatherers (24, 25). The PCA from the paper underlines how extremely closely related La Brana1 was to the hunter-gatherers from up north. That's despite the fact that he was from Iberia and his Y-chromosome belonged to haplogroup C6, while all of the successfully tested Y-chromosomes from among the Northern European hunter-gatherers to haplogroup I. However, just like Motala3, Motala12 and Loschbour from the Lazaridis et al. preprint, Ajvide58 belonged to sub-haplogroup I2a1, which is presently much less common across Northwestern Europe, especially in Sweden, than I1. It actually peaks today in the Balkans and Eastern Europe, and in fact the Loschbour I2a1b sequence is most closely related to that of a Russian from the HGDP dataset, sampled in the Kargopol district in the northwest of the country. It's still a mystery how I1, and also R1b, became so prevalent in Northwestern Europe after the Mesolithic. 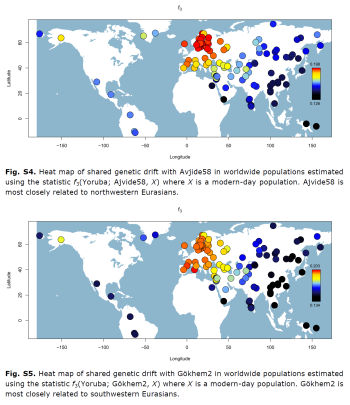 By the way, it warms my heart to see the following two figures in the supplementary material, in which the authors note that the sharp genetic differentiation between Ajvide58 and Gökhem2 is reflected in their varying affinities to modern northwestern and southwestern Eurasians. That's because two years ago I wrote a blog entry based on an ADMIXTURE run arguing that modern West Eurasians descend from two main ancient stocks: the Northwest Eurasians and Southwest Eurasians (see here). Looking back at that effort, I certainly rambled on and didn't quite hit the nail on the head, but the general idea wasn't too far off from what we're now finding out about our deep ancestry thanks to ancient DNA and more sophisticated methods. Interestingly, the Northern European sample with the lowest affinity to Ajvide58 are the Saami from Norrbotten, Sweden. This is most likely due to relatively recent Siberian ancestry among the Saami, which is essentially East Asian admixture and, as per above, not found among the Neolithic and pre-Neolithic North Eurasian hunter-gatherers or European farmers. I haven't had a chance yet to look in detail at the inferred pigmentation traits of the ancient Swedes. But Gökhem2 carried the derived alleles for SLC24A5 and SLC45A2, which means she probably had fair skin. On the other hand, Ajvide58 was ancestral at these loci, meaning he was probably dark skinned, much like La Brana1. However, as far as I can make out right now, tables S9 and S10 in the supplementary material suggest that both Gökhem2 and Ajvide58 might have been blue eyed and fair haired. 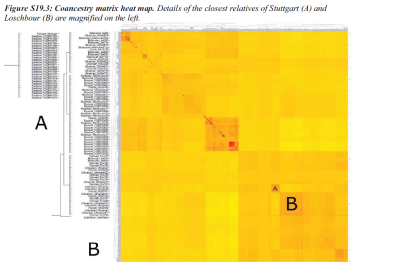 Skoglund, Malmstrom et al., Genomic Diversity and Admixture Differs for Stone-Age Scandinavian Foragers and Farmers, Published Online April 24 2014, Science DOI: 10.1126/science.1253448. The co-ancestry matrix (Fig. S19.3) confirms the ability of this method to meaningfully cluster individuals. We highlight two clusters: Stuttgart joins all Sardinian individuals in cluster A and Loschbour joins a cluster B that encompasses all Belarusian, Ukrainian, Mordovian, Russian, Estonian, Finnish, and Lithuanian individuals. 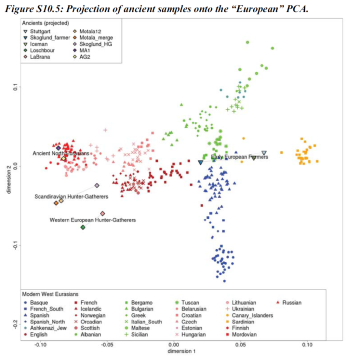 These results confirm Sardinia as a refuge area where ancestry related to Early European Farmers has been best preserved, and also the greater persistence of WHG-related ancestry in present-day Eastern European populations. 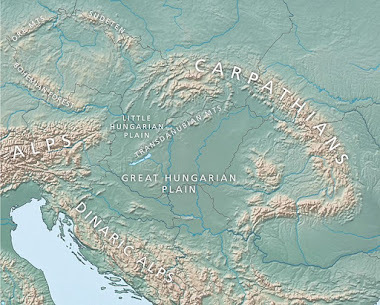 The latter finding suggests that West European Hunter-Gatherers (so-named because of the prevalence of Loschbour and La Braña) or populations related to them have contributed to the ancestry of present-day Eastern European groups. Additional research is needed to determine the distribution of WHG-related populations in ancient Europe. Fig. S10.5 suggests that the main axis of differentiation in Europe when the subcontinent is considered as a whole may tend to Northeastern Europe rather than SSE/NNW (8). This is consistent with our analysis of ancestry proportions in European populations (Fig. 2B, Extended Data Table 3) which indicate a cline of reduced EEF (and increasing WHG) ancestry along that direction.